It took just 65 minutes. It was scarcely surprising. 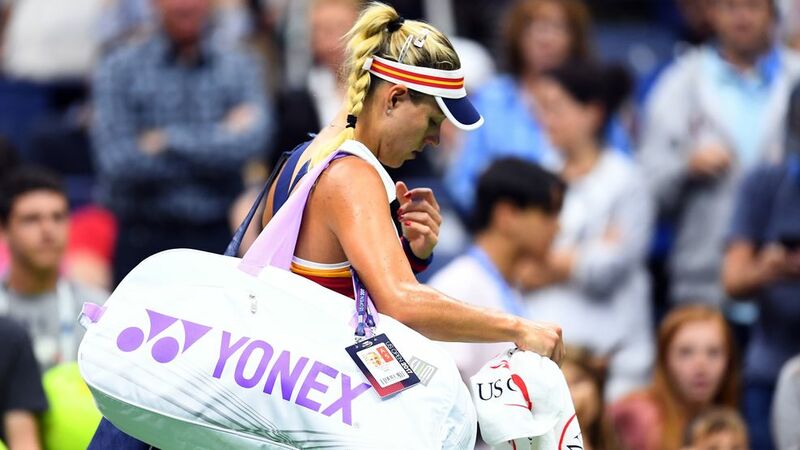 It was the first round exit of defending US Open champion Angelique Kerber, beaten 6-3, 6-1 by a hard-hitting teen, 19-year-old Naomi Osaka. The last 50 weeks had been a hard time for Kerber. Not since her victory in New York had she won a tournament. Over the course of 2017, her ranking had slipped from number one to six. All that magic dust that took her to the top a year ago had vanished. Barely in it in the first set, Kerber shriveled even more in the second. A year ago, Kerber could hardly miss the court. She was fast. She was forceful. Repeatedly in 2016, Kerber was the aggressor, masquerading as a counterpuncher, as she brutalized opponents with powerful crosscourt backhands and a forehand that could be sharply angled or, quite savagely, curled down-the-line. All of this mobility and execution compensated for Kerber’s serve, arguably a lefty motion worse than that of many a recreational player. Inspired, fit and focused, Kerber last year was a persistent contender. But sadly – for she is quite likeable – Kerber in 2017 has personified a horrible tennis phrase: Can’t find water in the ocean. Versus Osaka, she was repeatedly outmaneuvered and unable to connect when she had openings. Of four break points, she was unable to convert one. On her second serve, a frequently revealing stat, Kerber won a meager 7 of 19 points. Even more, Kerber had only struck nine winners and 23 unforced errors, precisely the opposite of the desired ratio. The analogy to Cinderella turning into a pumpkin was all too apt. The temptation is to say that Kerber’s 2016 was the aberration, that she’s now returned to earth and will likely resume a career ranked somewhere in the 7-20 range. Perhaps. Obviously. Maybe. Whatever. The tennis world takes its odd twists. We who follow it think we know, that experience and losses and statistics can inform our vision of the direction of a player’s career. But to accurately guess these outcomes – such as saying that Kerber will never again win a Slam – is merely a guess that in certain ways treats the player more like a commodity than an individual. Better yet to understand the mysterious process of matches, strokes, strategies. After all, who dared imagine two years ago that Kerber would embark on such a ride? Her clock may have turned midnight, but that also means she’s about to start a new day.